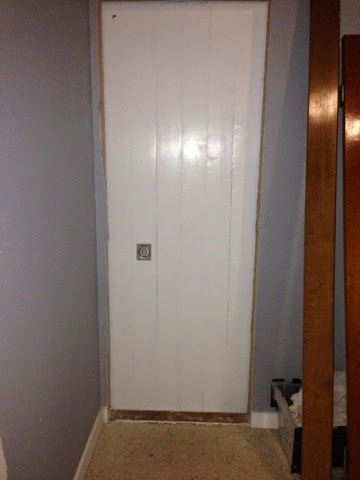 So we finally got around to putting a door between the playroom, and Scout's old bedroom. I was really anti-door, because I hate kids open, shut, slam, repeat games with doors. Drives me crazy and I'm always waiting for fingers to get pinched. But really, we needed something to close off that area while the kids are sleeping. Otherwise, they would never want to go to bed and I like that idea even less than door slamming. So Andrew thought of, built, and hung a barn door. I don't think either of us took any during pictures, oops. We read a bunch of different DIY posts from different sites so we could get an idea of what we liked and didn't like, but in the end he just pieced together what worked for us. He found some 1 1/2 inch thick, tongue and groove pine boards, cut them to size and then glued them together, holding them tight with a strap while they dried. He cut three boards to use as the Z on the door. 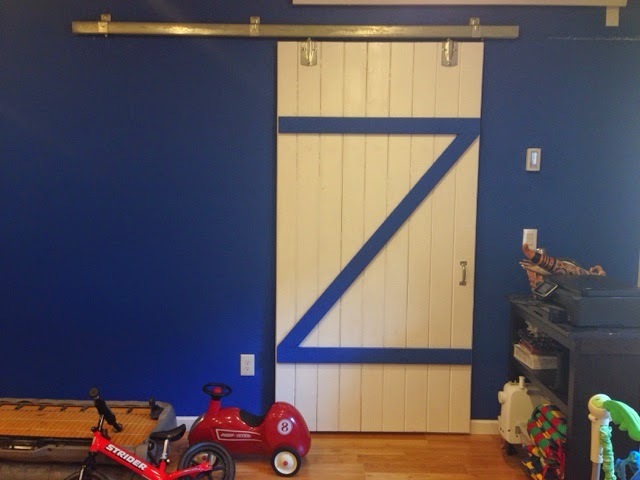 Then we (mostly he) painted the door white and the Z blue (to match the walls). He screwed the Z boards onto the white boards (door). He filled the screw holds with wood filler, sanded them down, and then repainted over them. You can see the holes, filled and sanded but not painted in the picture below. He mounted the box rail on the wall. He and Taylor lifted the door onto the wall. (This required sliding the rail over so the door could lay flat on the wall. It scuffed the wall, which you slightly see, and we haven't got around to touching up paint yet). He adjusted it so it hung level and put a piece of felt on the bottom where it touches the trim. He added a handle on the playroom side, and a ring on the office side (Scout's old bedroom). The ring lays flat in the door but lifts up, like you might see on a boat door. Handle and door from the office side. Sorry it's a bad picture, but the light is always awful in this room. Eventually, when the office (Scout's old room) is finished (floors, drywall, there is a bunch!) this doorway will get framed out with white trim. But for now, this is the doorway!